At AXPONA 2016 in Chicago, I met the man (A.J. van den Hul) himself. In addition to introducing two new cartridges at that show, the Crimson and the Colibri Stradivarius (both precursors to the cartridges in this review), Mr. van den Hul also hosted a one-hour “Cartridge Clinic” seminar. The audience watched a well-seasoned and respected veteran translate the complex inner workings of a cartridge into practical explanations, with the help of a microscope (with a camera projecting a real-time image of an actual cartridge on a screen). On top of this, Mr. van den Hul gathered a few cartridges from the audience and proceeded to inspect (and repair) a couple of them. In one instance, he straightened a slightly offset cantilever using a small set of specialized tweezers. In another, he aligned the coil former in an effort to adjust channel balance (and improve crosstalk). This rare event was enjoyed by all, novice or professional. The Van den Hul Crimson XGW Stradivarius reviewed here ($5495) has a cartridge body made of Hawaiian Koa wood, which contains a preferred type of fiber. (Koa wood is said to have good internal damping to limit motor vibrations to the ’arm and vice versa.) The outside of the body is coated with three separately applied layers of a Stradivarius-type lacquer that takes 3–4 weeks to cure for each coating. Van den Hul says the difference in how these coatings translate “sound speed” helps to reduce partial resonances. The cartridge coils are 24-karat gold drawn at low speeds to “avoid destructive impacts on the conductor.” The cantilever is solid boron and uses a VDH Type 1s (2x85-micron) stylus. The unit under evaluation has a 1.0mV output at 5.6cm/sec that provides ample signal level for use in many mc phonostages—just be sure to adjust the gain setting appropriately. Optimal recommended load impedance is in the range of 20–500 ohms. Both cartridges were installed on the Basis Audio 2800 vacuum and Basis Audio Debut vacuum ’tables. A variety of tonearms were used (Basis Audio SuperArm 9, Basis Audio Vector IV, and Graham Phantom III) with four different phonostages (Ayre P-5xe, Musical Surroundings Phonomena II+, Lamm LP2 Deluxe, and a custom-designed and modified unit called The Raptor). Both cartridges were played in for a minimum of 250 hours during the evaluation process. 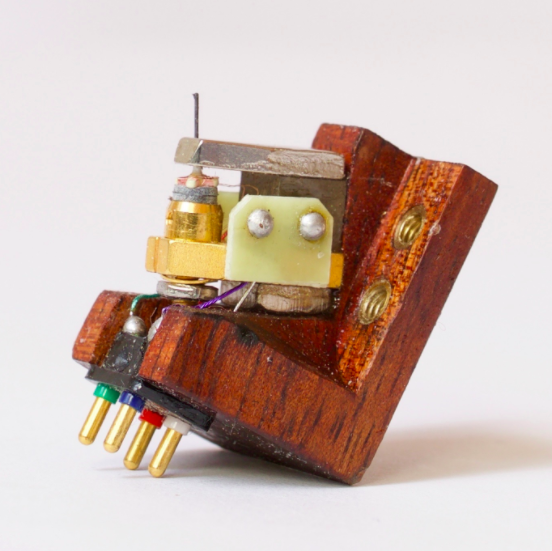 Each cartridge was installed in the standard configuration recommended by the manufacturer, and again using a more involved process I’ve developed over the years (see http://www.theabsolutesound.com/articles/setting-up-a-phono-cartridge-1/). One of the more favorable measured results of my own set-up procedure was a channel separation of 35.9dB in both channels for the Crimson XGW Stradivarius. The Colibri XGW Signature Stradivarius had even more impressive 39.6dB (left) and 40.4dB (right) channel separation—up there among the highest I’ve set and measured. The Crimson XGW Stradivarius is impartial across most of the frequency spectrum (including the presence range), but exhibits large macro-dynamic contrasts from the power region on down. It is quite forceful on transients (every bit as good as a cartridge should be in its price range) but less delicately detailed than its Colibri cousin when parsing complex music passages. The Crimson counters by surpassing its Colibri cousin in sheer bottom-octave drive with propulsive music. While not carrying the five-figure price tag, this cartridge isn’t embarrassed in the company of competition at two (or three) times the asking price in most areas of performance. Its soundstaging, energy, dynamic pacing, and drive are very much above average. This description also applies to the general sound of the Crimson—a personality that clarifies and brings forward the presence region with a lucidity that is unique. The Colibri XGW Signature Stradivarius takes those characteristics, shakes off a bit of the sweetness, and adds a huge dose of authority to every aspect. This is not just the result of its 0.75mV output level. The Koa-bodied Signature Stradivarius is also more dynamic (both micro and macro) and livelier-sounding than the Colibri XGP, has a larger soundstage, produces more powerful transients, is more propulsive, and offers more clarity of musical presentation. The Colibri XGW Stradivarius’ personality is even more flamboyant than that of its siblings. Prokofiev’s Violin Sonata No. 1 in F minor, played by Nadja Salerno-Sonnenberg accompanied on piano by Sandra Rivers, is an excellent piece of music. With it, one gets the sense of the transient response of the violin along with its speed and beautiful timbre, as well as a piano that sounds like an actual piano in a real space. The Crimson XGW Stradivarius played back the violin very smoothly with more of the body of the instrument. The piano was set back further while being fuller sounding with more of the signature of the soundboard. The Colibri XGW Stradivarius produced a beautiful string tone with ample harmonics coming off the violin. One could almost feel the pressure of Nadja’s fingers coming on and off each string as she played the notes—very impressive. The piano also had more harmonics coming off the strings and soundboard from hammer strikes. With this cartridge, there was a greater sense of emotion and tension in the performance.